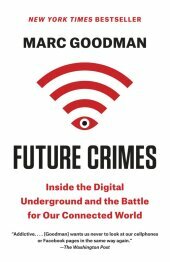 From former FBI Futurist, Interpol advisor and beat cop Marc Goodman, a deep dive into the digital underground illuminating the alarming ways criminals, corporations, and even countries are using new and emerging technologies against you--and how this makes everyone more vulnerable than you ever thought possible. Technological advances have benefited our world in immeasurable ways, but there is an ominous flip side: our technology can be turned against us. And just over the horizon is a tidal wave of scientific progress that will leave our heads spinning-from implantable medical devices to drones and 3-D printers, all of which can be hacked, with disastrous consequences. With explosive insights based on a career in law enforcement and counterterrorism, leading authority on global security Marc Goodman takes readers on a vivid journey through the darkest recesses of the Internet. He explores how bad actors are primed to hijack the technologies of tomorrow. Provocative, thrilling, and ultimately empowering, Future Crimes will serve as an urgent call to action that shows how we can take back control of our own devices and harness technology's tremendous power for the betterment of humanity-before it's too late.